Liferay Portal is a framework which comes with a fine grained security/permission model, (Web) Content Management, Authentication and Authorization, outbox portlets with different features to manage content or users. So if any business application has below questions then I can recommend not to use Liferay as a platform. Application is big but not content or user driven. Application with few static contents. Application with batch transactions(DB) i.e. insert , update db records in batch. Application with Big Data support. OpenSource: Liferay is open source portal framework so developers can easily extend or customize it for their organization or department based on their requirement. OutOfBox: Liferay Portal is not only a portal platform. It also provides a 60+ applications and tools included in the form of portlets. These portlets are available out of the box or in the form of plugins. MarketPlace: Liferay has it own market place (i.e app store) where developer or contributors are contributing their ideas (application) so community can use it freely (some are paid). Enterprise-Ready Portal Solution: It is fully ready to support mission-critical, enterprise applications in an environment configured for multiple redundancies and 24/7 up-times. High Availability and High Performance: Liferay Portal has been tested to support more than 3,000 concurrent transactions (33,000 simultaneous users) on a single 8-core application server, with mean login times under one second and maximum ½ throughput of 79+ logins per second. Liferay Portal has proven to handle millions of page views and over 1.3 million users. A lot of the OOB (Out Of the Box) components are still a little buggy and not fully ready to go without some minor tweaks. Since the software was acquired not too long ago by Adobe, a lot of Adobe integrated solutions are not fully baked yet. That is getting better with time. Portal Security: It has good security model but in few areas it requires improvement. Configurations: Less configurations from properties files and provide more GUI to update from control panel. We are currently using Liferay Portal and plan to keep using it. Alfresco: Very good CMS but not good for presentation or front end technology.Portofino: Not much scalable and high available CMS.eXo Platform: Slowly growing in market but not mature community like Liferay and less support from community.Microsoft SharePoint: Proprietary Software from Microsoft. Nuxeo ECM Platform: Picking up the market but not mature community and support from the community. I am not involved in the acquisition part of AEM as the client was the one involved in that decision. Liferay scales well both in terms of performance but also in terms of operational self-service and eases the burden on IT. Compliance, Marketing and Client Engagement teams can create and modify content and submit it for approval. This results in lower operational costs in the areas of new private-label sites and maintenance of current sites because, prior to Liferay, site content management required expensive IT software engineering resources to implement compliance and marketing content changes. 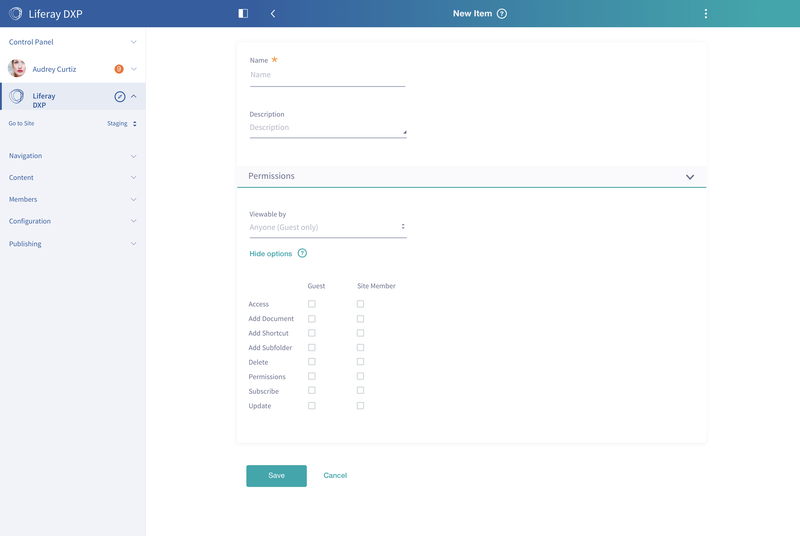 Liferay Digital Experience Platform (DXP) forms experience was designed to make generating forms simple and straightforward while offering flexibility and deep integration with back end systems. Email sales@liferay.com for pricing information.